In a much anticipated and often discussed product feature, OLEDWorks LLC announced the availability of the Wave, which the company boasts is the first commercially available OLED lighting platform on flexible glass. The Wave FL300C panel offers up to 300 lumens of brightness, at an efficacy of up to 62 lm/W (at 100 lumens), a lifetime of up to 50,000 hours (at 100 lumens) and a CRI of 90 R9 50. The panel can be curved to a minimum radius of 10 cm. The Wave is available in a warm white (3000K) model and a neutral white (4000 K) model. ​The Wave, is part of OLEDWorks LumiCurve product family on Corning® Willow® Glass, a flexible glass material. 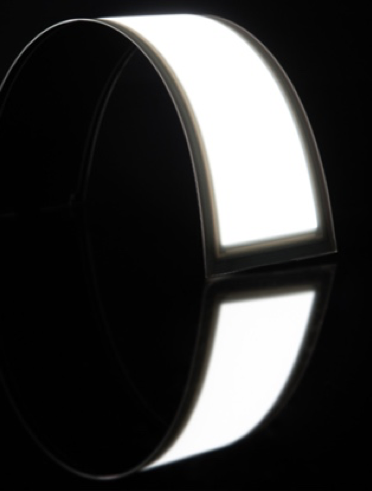 According to OLEDWorks, the inherent hermetic barrier characteristics of Corning’s Willow Glass offer bendable surface lighting without compromising the durability and lifetime of an OLED panel. Organic LEDs provide a naturally diffused light source without glare. The company says that the Wave couples, a thin, featherweight form with bold lighting functionality, thereby enabling exceptional design concepts with applications ranging from architectural lighting to transportation.